Interested in crafts? 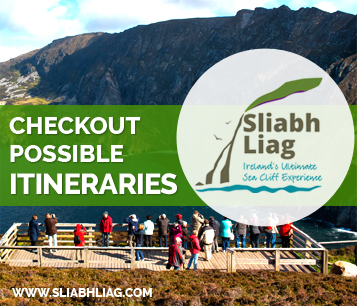 Then Studio Donegal is an ideal stop while visiting the Sliabh Liag region. The company is a hand-weaving and clothing manufacturing business which is located in Kilcar Co. Donegal. The company have an open factory for visitors to come and observe the skills that have been passed down from previous generations. The art of weaving is a celebrated Donegal tradition. Studio Donegal also have a range of fabulous handmade unique goods for sale on the premises. Muckros Head is one of South West Donegal’s hidden gems. These cliffs are renowned for their breath taking scenic landscapes. 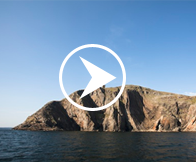 Located on the outskirts of the village of Kilcar and just 10km from Killybegs, Muckros Head is an accessible viewing point that any visitor to the Wild Atlantic Way will appreciate. Sliabh Liag, St. John’s Point and Ben Bulben Mountain Range in Sligo can all be seen from Muckros Head. There is also an array of rich fauna and two beautiful beaches to walk along. Rock climbing is also a popular activity of Muckros and people flock from all over Ireland to climb the famous overhangs. Unique Ascent is perfect for those who want an outdoor adventure holiday in Donegal. Hill walking, rock climbing, sea stack ascents, mountaineering, sea kayaking are some of the guided packages they offer. They offer a full range of courses and guided packages along the rugged coast and mountain ranges of Co. Donegal. All the guides within the company as known for their expertise and their ethos for customer care for all visitors to Donegal. Experience the Wild Atlantic Way in Style with Unique Ascent.